It’s definitely time for you to replace your gutters, one of the most common home maintenance tasks. Especially if you’ve always been a fan of the DIY lifestyle, you’re likely curious about how to install gutters on your own. Doing so is also an excellent way to save some money, and entitles you to serious bragging rights for at least a month afterward. Still, there are a few things you need to know about how to install rain gutters the right way before you give it a go. Read on to learn the tips and tricks you need to succeed — as well as when it’s time to call in the professionals. The first step in learning how to install gutters on your own? Make sure you do your homework when it comes to the type and size of gutter you need. Most residential homes will use aluminum gutters in the “K style” that are about 6 inches wide. When it comes to the right gauge, usually 26 is the industry standard. However, especially if you’ve never done your own gutter installation before, going with a 32 gauge is a safer bet. You also need to take your climate into consideration. You may find that vinyl gutters are all it takes to stand up to the weather in your area. You may want to opt for a round gutter instead of a K style option. Especially if you’re a beginner, it can be easy to think that the right place for your gutter is along the edge of your roof. However, the “sweet spot” for gutter placement is actually about 3 inches under your roof’s edge. This is because water goes off your roof’s edge and is also pulled up underneath the edge, as well. If you don’t install your gutters in the right place, the water will quickly damage your fascia, your deck, siding, gardens, and even threaten the structural integrity of your home as a whole. Another hack to help you make sure you’ve positioned your gutters correctly? Start by setting them out on your lawn. This makes the process of cutting the gutters down to size a whole lot easier. You can even install the connectors for downspouts on your lawn. This makes the process both simpler and safer for you. In addition to knowing where to put the gutters themselves, you also need to think about where you plan to put your downspouts. This is one of the first things you should do, because it will help you to properly align your gutters. One of the best places to put these downspouts is as close to roof corners as is possible. Make sure that you have a downspout at least once every 20 feet. This will help to reduce the chances of clogging. 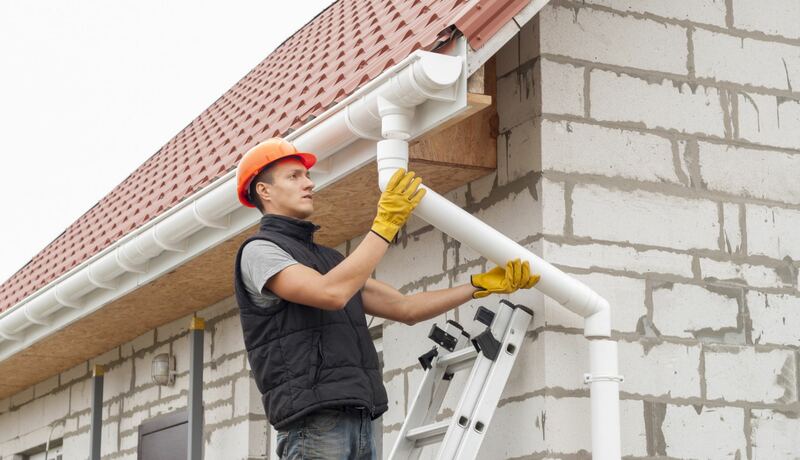 Once you’ve installed both your gutters and downspouts, you need to be certain that everything has completely sealed. To test things, we suggest you get a gallon of water and run it through your gutters. Ensure that the sealant is completely dry before you do this test. For best results, wait between 12-24 hours after your installation to test the sealant for the first time. We know that you’re looking to save on the cost to install gutters by doing it on your own. But sometimes, you need to work with a professional because it’s not only a safer decision, but also the more financially sound option. First of all, if you suspect that you have a serious infestation of either rodents or bugs in your gutters (not just a single confused creature) don’t go the DIY route. You don’t want to risk exposing yourself to diseases, and you also need to be certain you find the source of any nests and points of entry these pests are using to set up shop in your gutters. If your roof is especially high, or if you’re a bit older or not as spry on your feet as you’d like to be, you should also leave it to the professionals. The same goes if you don’t have the tools or replacement parts you need. Remember, buying the wrong parts and not being able to return them is a costly mistake. Visit this page to see how professionals determine your quote. Finally, remember that DIY work doesn’t come with any warranties or guarantees. Do you really want to be out there fixing the same problem again in a month? We hope that this post has helped you to feel more confident when it comes to learning how to install gutters on your own. However, remember that sometimes, it really is the best option to leave things to the professionals. Even if you weren’t able to conquer gutter repair and installation without the experts, there are plenty of other DIY home improvement and decor projects you can try on your own. It doesn’t matter whether you’re getting ready to put your home on the market and need to increase your curb appeal, or if you want to master easy fixes. Keep checking back with us for all the DIY tips and tricks you need to improve your home. Ready for a new home? Browse through our property listings to find the house of your dreams.